Mass of Christian Burial for the Reverend Theodore E. Tack, O.S.A. Brothers and sisters, to all of you who have come here today to honor the life and to be united in prayer as we commemorate the passing of our dear brother, spiritual guide, friend, Father Ted Tack. Remembering Fr. Ted Tack, O.S.A. Before going any further, I would like to express, on behalf of the whole Order of St. Augustine, our deepest sympathy to the family, and especially to you, Sue, and to all those who loved Father Tack. The sense of loss that we all experience is great, because we have lost the presence in this life of a great man, a deeply committed priest and religious, a person who was humble and profoundly human, and yet one whose life truly inspired, as it exemplifies what it means to respond fully to the call to holiness that we all receive in our baptism. We have indeed lost a great man. Mother Theresa once said “we cannot do great things in life. Only small things with great love.” This may or may not be true, but we have certainly had the privilege of seeing some great things in the life of Father Ted Tack. He was a man who was greatly loved and who loved greatly, with the consequence that the loss that so many feel is also great. So the words of St. Augustine are indeed a consolation to us today: “Of necessity, we are sorrowful when those whom we love leave us in death. Our weakness bears us down, but our faith bears us up. We sorrow over the human condition, but find our healing in the divine promise.” (St. Augustine, Sermon 172). If I even began to share with you some of the wonderful testimonies I have received in the past few days from Augustinians around the world, expressions of the affection and loyalty and appreciation that so many have for Father Ted Tack, and the gratitude and admiration for all that he did as an Augustinian, we would be here for a very long time this morning. . People have written about everything from heartfelt gratitude for the leadership given by Father Ted to the whole Order to his playing basketball or tennis with seminarians as he would visit different houses of formation. But first and foremost, it is my suggestion that we do nothing more and nothing less than Ted would himself want: that we reflect together on the Word of God, and look, with eyes of faith, to the true source of Life and Love. There we will indeed find our consolation. Many of you knew Father Tack as a teacher. Before he became Prior General, he taught moral theology in Rome. After concluding his second term of office in Rome, he returned to the Midwest Province, and was eventually assigned here to the monastery of Cascia Hall. He was headmaster, and even after retiring from that difficult and challenging job, he continued to teach, right up until the academic year of 2011-2012, when his health no longer allowed him to keep up the service he so much loved. In addition, Father Tack taught the novices, both in the United States and in Peru. He was also frequently committed to preaching retreats, and giving courses to adults on different aspects of the life and spirituality of St. Augustine. Simply put, Father Tack was a true teacher. Now listen for a moment to the words of Father Tack – as he describes himself in his role of teaching St. Augustine. “I am an amateur in the root meaning of that word, that is a lover of Augustine's teachings without making any pretensions of being an expert. I have no doubt in saying that one of the reasons that Ted loved to teach Augustine, to read and study Augustine’s writings, is that it is in St. Augustine that one can really understand the depth and breadth and height of human experience – experience within which we can ultimately find the presence of God. “Augustine understood” writes Ted, and offers valuable insights “into ourselves and others regarding the constant struggle in our hearts between good and evil, the hidden motivations that frequently prompt us to act, the pride which often destroys the good we seek to accomplish, the insatiable thirst for true happiness – for God, that is – and our great difficulty in achieving this happiness; the power of passion to assert its control over our lives, if we don’t assert ourselves in an opposite direction; the destructive force of division, as well as the beauty of friendship and living in harmony with others who share common interests.” “Augustine was able to pair his understanding of human nature with deep insights into the teachings of Jesus. And that is essentially why he can still be a guide for all Christians today: because he teaches Jesus to us in a very human way.” Would I be far from the mark if I say this morning that the same thing is true of Father Ted Tack? He indeed did teach Jesus to us, in a very human way. There are so many other things that could be said this morning: The struggles and sacrifices taken on by Ted to promote unity, and community, within the Order and in the Church. The very faith that guided and nourished Ted’s life; his love for the Church; his willingness to serve as spiritual director for many people; his friendship; his sense of the vow of poverty and the simplicity with which he lived. But perhaps everything could be summed up in what we might call, what he understood to be, the ultimate meaning of life. Once again, Ted himself becomes the teacher for us. I share with you two little clippings that were pinned to the wall of his room. And the second is a poem, that expresses so well what Ted himself told some of you in the days leading up to his death. These words truly describe the deep inner longing, the “Augustinian desire for unity with God”, that Ted had sought, and was finally ready for, as he approached the end of his earthly life. Oh the joy to see you home. 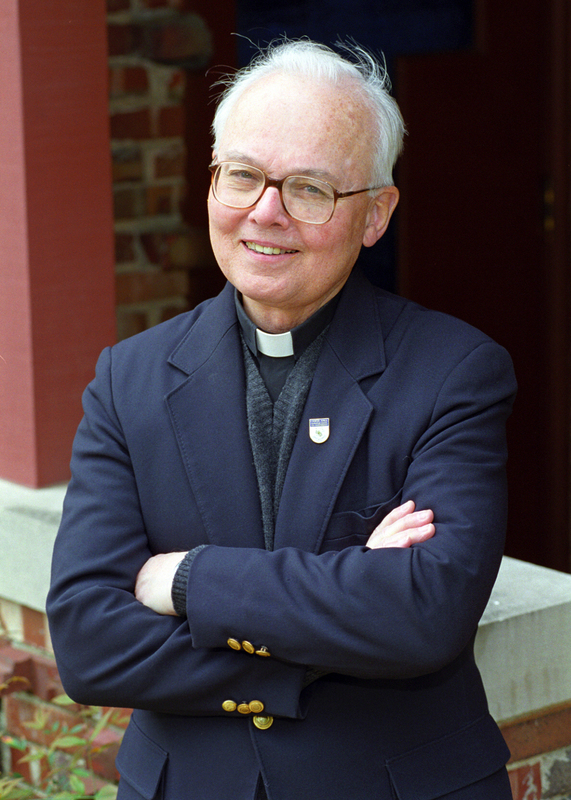 The last words that Ted Tack spoke on Sunday, while Father Marty Laird held him in his arms, were “Lord, have mercy on me.” We place all our trust in God, and pray that God will indeed have mercy on the soul of Theodore Tack, and that God will lead him gently home.